New Delhi: The Indian government has announced a pilot study ahead of a comprehensive plan, to assess whether dams being constructed on the Ganga and its tributaries in Uttarakhand could dry the river downstream, along towns such as Varanasi and Allahabad in neighbouring Uttar Pradesh where the river is considered sacred by many Hindus. According to the minutes of an October ministry of environment and forests, or MoEF, meeting reviewed by Mint, such an assessment would be extended to the entire Uttarakhand stretch of the river, based on the results of a preliminary study on the Gangotri-Dharasu stretch on the Bhagirathi, a tributary of the 2,500km long Ganga. The pilot study, according to the minutes, will cover the operational, ecological, religious and cultural impact of the hydroelectric project, Lohari-Nagpala, which is being built. The ministry expects to complete the review by early next year. Other major dams being built in Uttarakhand include Pala-Maneri, Maneri-Bhali and Bhairon Ghate. The Ganga, which originates in the Himalayas, passes through four Indian states before flowing into the Bay of Bengal in the east. The ministry also plans to do a similar review on the entire Indian stretch of the Ganga, the minutes said. But it hasn’t yet decided on covering dams that are already operational under the review. Current environmental laws don’t require the Union government to take a holistic view of any river basin. Environmental impact assessments, or EIAs, of hydroelectric projects have to be done only on a case-by-case basis. Last week, along with declaring the Ganga a national river, the Centre also announced the creation of the Ganga River Basin Authority, whose aim is to ensure the river is kept clean. Some analysts note that the timing of the authority appears to stem from national elections due early 2009 as many leaders in Uttar Pradesh have made pollution and the drying river bed issues to rally support. “Whenever multiple dams are proposed, it is crucial that we have an understanding of the cumulative impacts while taking a decision on the environmental and social viability," said Neeraj Vagholikar of Kalpavriksh, an activist group that works on environment and conservation issues. “It is clearly not enough to only evaluate each project individually during the environmental decision-making process. We need to understand riverine ecology, fragmentation of forests in the river basin, social impacts on local populations, downstream issues and so on." This is not the first time the need for a cumulative impact study of a series of dams on river basins has been raised in the government. In a December 2006 report, a Planning Commission task force on governance, transparency, participation and environmental impact assessment for the 11th Five-year Plan, recommended the need to “conduct impact assessments of the combined effect of projects within the same basin, or across basins where the impacts are related; these should be based on carrying capacity studies of the ecosystems in the concerned basins..."
Also, the National Environmental Appellate Authority passed an order in April 2007 on the Pala-Maneri hydroelectric project in Uttarakhand for a “cumulative study of a series of different dams coming on any river so as to assess the optimum capacity of the water resource, giving due consideration to the requirement of human beings, cattle, ecology/environment..."
MoEF, however, hasn’t implemented the order when prescribing terms of reference for EIAs. The expert appraisal committee, or EAC, on river valley and hydroelectric projects, which accords environmental clearances to such projects under the ambit of MoEF said in a June 2007 meeting that the panel didn’t agree to this suggestion and decided to oppose it. An EAC official declined to comment on the issue. More recently, Assam raised the same issue after parts of the state reeled under floods, which were blamed on upstream dams, in August. “During monsoon they (upstream states such as Arunachal Pradesh and Meghalaya) release water, which create havoc here. The dams in Bhutan have eroded the Manas biosphere reserve. We are getting the short end of the stick. We are going to address this issue with the Prime Minister soon," said Pradyut Bordoloi, Assam’s minister for power and industries and also the chairman of north-eastern power coordination committee, which includes all power ministers of the North-East. North-eastern India has the highest hydropower potential in the country. The Central Electricity Authority, or CEA, estimates the North-East accounts for about 63,000MW of India’s hydroelectric potential—this includes 50,328MW from Arunachal Pradesh alone. The 2,000MW Lower Subansiri hydroelectric project in Arunachal Pradesh, too, has had its share of problems. While according clearance to this project, the National Board of Wildlife had set a condition that no other dams will be allowed upstream. The state, however, went to the Supreme Court saying such a condition is unacceptable. The court sent it back to the board and a decision is pending. All this could also trigger water rows between states, more so with water being a state subject, say experts. “There are already lot of inter-state conflicts and this can be one, too. Therefore, this discussion should be included in the ongoing deliberations on water sharing," said Ritwick Dutta, a Supreme Court lawyer specializing in environmental issues. “Look at Kotli Bhel," he said. 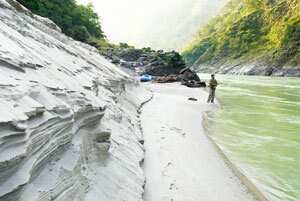 “Three projects (on the Ganga) that have been approved but forest clearances are pending. A cumulative study should be insisted on (for) these projects, especially on which work has not started or on projects where changes can still be made so that corrective measures can be taken. Otherwise it stays an academic exercise."